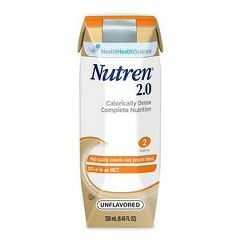 NUTREN® 2.0 Complete Calorically-Dense Liquid Nutrition.This ready-to-use formula provides complete nutrition for those with very high calorie needs or restricted fluid requirements. This unique formula provides complete, calorically dense liquid nutrition for those on high-calorie diets or highly restricted fluid diets. NUTREN® 2.0 contains 100% of the RDI for 20 key vitamins and minerals, plus taurine, carnitine and ultra-trace minerals for long-term feeding. 75% of the fat content is MCT, a fat source that is easy to absorb. Can also be used for oral supplementation. Ingredients: Water, Corn Syrup, Calcium-Potassium Caseinate (from Milk), Medium Chain Triglycerides (from Coconut and/or Palm Kernel Oil), Maltodextrin and less than 2% of Sugar, Canola Oil, Soy Lecithin, Corn Oil, Potassium Citrate, Calcium Citrate, Magnesium Chloride, Sodium Phosphate, Choline Chloride, Salt, Potassium Phosphate, Sodium Ascorbate, Sodium Citrate, Citric Acid, Magnesium Oxide, Taurine, L-Carnitine, Alpha-Tocopheryl Acetate, Zinc Sulfate, Carrageenan, Ferrous Sulfate, Niacinamide, Calcium Pantothenate, Vitamin A Palmitate, Dextrose, Manganese Sulfate, Pyridoxine Hydrochloride, Color (Turmeric Extract), Copper Sulfate, Riboflavin, Vitamin D3, Thiamine Mononitrate, Folic Acid, Biotin, Sodium Molybdate, Potassium Iodide, Chromium Chloride, Sodium Selenate, Phytonadione, Vitamin B12. "Didn't know until I tried it"
Previously I got the 1.0. I should have ordered the 1.0 or the 1.5 as the 2.0 is too thick and hard to swallow. It did not agree with me either. I will have to try to mix it with something else to use it. My own fault for thinking it would give me more of a "boost". by Skinny - Minnie from Grand Island, Ne. Prices go up one month , down the next. G-tube feeding. Good Value. Nutritional. Meal Replacement. Everyday Use. Complete enteral nutritio. For my son who is disable. My son has multiple disabilities and has a g-tube for feeding. His only nutrition is Nutren 2.0. He has used it for the past 6 years and has maintained his weight nicely. He is unable to tolerate large volume feedings and is restricted as to how much fluid he can consume in 24 hours so Nutren is perfect for him. I've been losing a lot a weight during cancer treatments. A nutritionist at the cancer center told me about Nutren. I add a few teaspoons of whey powder to every can. Dissolves easily in a shaker bottle, so easy to pump through a stomach tube. The whey adds a lot of protein and is easy to find and inexpensive. I use 3-4 cans a day and the scale is slowly going up instead of down. I have a narrow esphogus and can swallow only liquid or very soft moist food, hence I have a stomach tube to help supplement my calories. Nestles Nutren has the most calories and nutrition per ounce that I've been able to find. However, it's high sugar and I'm even less thrilled with the sugar free alternative. Still, short of grinding my own food, it's the best I've been able to find and its okay to drink or to use in the tube.